It’s time to celebrate summer with picnics, parties and ice cream… or in this case ice cream cone cookies! 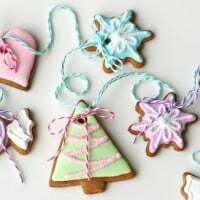 I got a little crazy and made some three scoop ice cream cones, but this set of cookies is really more just an invitation to pull out some cookie cutters and play! For the 4th of July you can get away with making just three colors of icing without anyone thinking you’re lazy! =) In this case, you will need one extra color, light brown, for the ice cream cones. Still, pretty easy! For this set of cookies I just pulled out a few star cookie cutters, a small heart, an ice cream cone and a mini cupcake. It seems I can’t make a set of cookies without throwing in a few cupcakes! First, you’ll need a batch cookies made with my Sugar Cookie Recipe (or your favorite). Then, mix up a batch of Royal Icing. 1. Cut out some ice cream cone cookies, as well as several just “scoops” of ice cream. 2.-3. Use a large round cookie cutter to trim off the top of a whole ice cream cone cookie, and also to create a little curve in the “scoops” of ice cream. 4.-5. When you have one full cone and two trimmed “scoops”, assemble them on a silpat lined (or parchment paper lined) baking sheet. Simply lay the pieces next to each other, like puzzle pieces. Press along the seam just a bit. As the cookies bake they will expand just enough to fuse together. When the cookies are baked, allow them to cool slightly on the baking sheet before moving. 6. Decorate your three scoop cone cookies! I would suggest starting by outlining and flooding the center scoop (in this case white), and the cone itself. Once those areas set up a bit (at least 30 minutes), you can fill in the red and blue scoops. Once the base icing is set in each area, add an outline and/or sprinkles, as desired. Looking for more 4th of July inspiration? 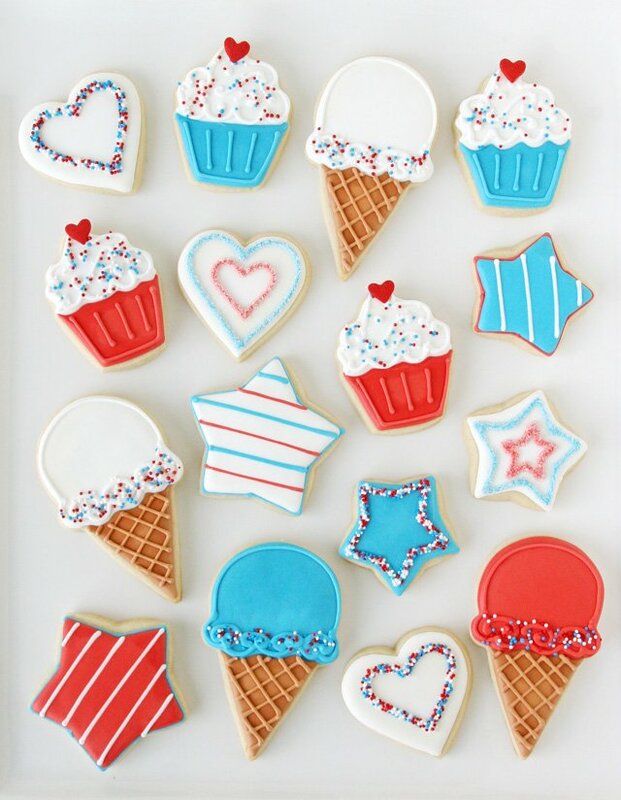 Here are some cute 4th of July Star cookies, along with 20 Ways to use a Star Cookie Cutter! The always impressive 4th of July Flag Cake! Simple and delicious Red, White and Blue Mini Cheesecake Trifles! 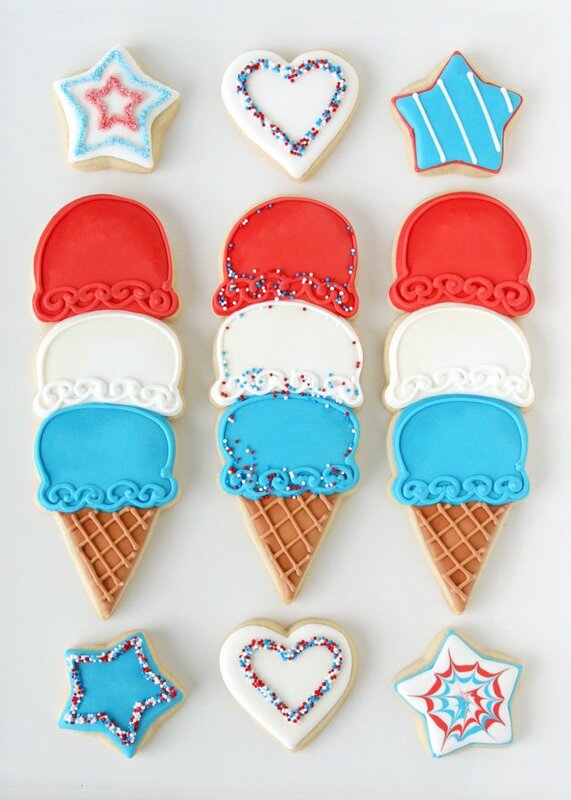 And be sure you’re following Glorious Treats on Pinterest where I have a whole board of 4th of July treats and ideas! These cookies are seriously amazing! So cute!! Pretty! These are adorable! Love them! Aw wow! So cute! Seriously perfect, could eat a few of these right now! Those little cones are absolutely adorable!! Glory, these are so fresh and bright, just a really cheerful and patriotic set! Because they are simpler in design, I love how boldly they coordinate, and jump out at you. I think what I am trying to say is I love your style! Happy 4th, happy summer! Thanks! They were fun to make! Thanks Rachel! We have pretty dry weather where I live, so I’m not really an expert on decorating in humid weather. I would certainly suggest using an oscillating fan on low in the room where you are decorating. This should help with drying. Also, I know many of my decorating friends love to use a food dehydrator to dry their cookies, this might be a good option for you as well. You’ll have to experiment a bit and see what works for you. Happy decorating! cuteness overload, I’m loving these!! These are so perfect! I especially love the triple-decker cones. 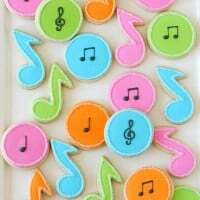 Oh my these are the cutest cookies I have ever seen! Loving the colors, so patriotic! What a cute idea. I love the decorations, how talented you are!!! These are so adorable!! You are so talented. I’ll have to start practicing now in order to be ready for some 4th of July parties!! These are perfection! Those ice cream cones are too cute! Hi, I m from iran. 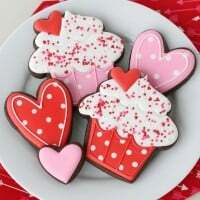 Your cookies are amazing, I have a question of you.how you make your icing that it seem so shining and whit no bouble?? ?special on folding icing. 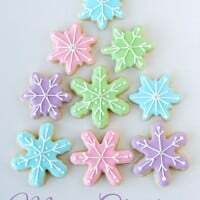 Can i have royal icing recipe?